Over the past five years, since 1998, NEADS has organized ten Disabled Student Leadership Forums across Canada. These events have been held in Montreal, Ottawa, Calgary, St. John's, Antigonish, Yellowknife, Winnipeg, Toronto and Victoria. 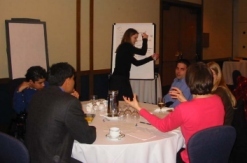 Two meetings have taken place in Montreal, and project workshops were held in Ottawa in conjunction with the November, 2002 national conference. Detailed reports on each of these meetings are available on the NEADS Web site at www.neads.ca. The ideas and issues discussed with participants in this initiative from 1998 - 2001 fell into the following distinct areas: support to campus organisations, support to individual students, expanded internet services, high school outreach and differences between small and large post-secondary institutions. As noted in previous reports, the NEADS board of directors decided to build on the success of these meetings by expanding the topic areas discussed to include employment. This decision was made based upon an awareness of the importance of labour market issues and access to the job market for graduating students, and the importance of summer or part-time work for those still in school. With the board's direction, NEADS has moved to develop an exciting partnership with Human Resources Development Canada's (HRDC) Youth Initiatives Directorate, through the federal Youth Employment Strategy, in order to deliver a new project with additional, employment related components. Successful forums were held in Toronto, Victoria and Montreal in 2001/2002. A second phase project ensures that NEADS can hold additional forums in 2002/2003 in: Calgary, Vancouver, Halifax and Ottawa. The forums are sponsored through a contribution agreement with the Youth Initiatives Directorate (Information and Awareness Program) and are being hosted by members of the NEADS board of directors in collaboration with the Association's national office and a project consultant. Students with disabilities are invited to participate in the forums, to lend their insights to the issues at hand. A number of groups and organisations are asked to speak to the students: regional HRDC representatives, employers and employment agencies, and leaders of both student and disability organisations. This report is based on the proceedings of the first NEADS Student Leadership and Employment Forum of 2003, which took place on Friday, February 7 in Calgary, with students from Mount Royal College, the University of Alberta and the University of Calgary in attendance. Approximately 45 students, representatives from community organisations, service providers, employers and federal bureaucrats attended the meeting. Officials of the Science & Technology Ability Recruitment/Retention Initiative (STARR) were also at the Calgary forum, setting up a display table outside the meeting room and participating in discussions through the day. The purpose of STARR is to increase the representation of persons with disabilities in science and technology jobs across the federal Public Service and in science based departments and agencies. Steve Estey commenced the day's proceedings by discussing the background of NEADS' Student Leadership and Employment Forums project, and his role as project consultant. 2003 marks the fifth year that NEADS has held Student Leadership and Employment forums, in cities across Canada. Estey explained that his experience as past president of NEADS, as well as his extensive work within the disability community, has allowed him to contribute to the project as a consultant since its inception. Estey noted that, as the forums have taken shape over the years, they have served as venues for both students with disabilities and employers to learn more about each other, as well as a way for NEADS to hear from students on the issues that are important to them. Estey thanked everyone for attending and asked participants to introduce themselves to the group before getting underway with the Calgary forum. Alison Beattie introduced herself, and talked briefly about her role with NEADS. She told attendees that she is in her second year of disability studies at Mount Royal College, and in her fourth year of post-secondary education. Alison's involvement in NEADS began after she attended her first national conference in 2000, and she was recently re-elected to the NEADS board of directors as the organisation's Alberta representative. Alison introduced the speakers on the morning panel, before turning the floor over to the first speaker. Chris Gaulin began the speakers' presentations by discussing his work as NEADS' Website architect, as well as acting as a CampusNet project consultant. He told the group that he would be talking about CampusNet and the benefits that project can have on student leadership. The CampusNet project was started by NEADS more than a year ago with funding from the Office of Learning Technologies (OLT), Human Resources Development Canada. CampusNet is an online community, bringing together student leaders from across the country to share ideas and strategies with one another. There are currently twenty member groups of CampusNet, and Chris noted that the sharing of ideas between these members has been very positive. It has definitely been a learning process for the Association and participating groups. Chris spoke about the involvement of the project team in ensuring CampusNet grows and prospers. In addition to himself, several NEADS board members and consultants serve in technical and advisory roles, while NEADS' National Coordinator, Frank Smith oversees the project management. The CampusNet team determined it was important to include community partners in the process. To that end, Adaptech, a Montreal organisation that conducts research on adaptive technology issues in post-secondary education, has added support and input. AQEIPS, the Quebec Association for Post-secondary Disabled Students, has also played a role in the project. He said that the various partners add a variety of ideas to the project from different perspectives, and the fact that all the principal players involved are students ensures that the student leadership focus of CampusNet is maintained. Chris mentioned that CampusNet offers a free online community that students with disabilities can access. Additionally, the CampusNet team wants to expand the project's services to provide Web training to student leaders so that their groups can have an Internet presence. He said it's important for student groups to have the resources needed to get their message across on the Internet. Chris discussed the various phases of the project, from initial design to the current and future plans. He mentioned that in addition to allowing students to share leadership ideas with one another, the CampusNet team will include employment information and components within the online community, as part of the commitment during phase II of the OLT funded project. "It's fine and dandy to have good student leaders on campus, but in the end we're all in it to finish and get a job," he said. The CampusNet website will feature "WorkLink," a place where employers can post job opportunities and where students can post their résumés. This section of the site is now in development. Chris ended his presentation by encouraging those in attendance to discuss the project with him if interested, and to consider joining. He provided a demonstration of the Website and its many features. CampusNet can be accessed through the NEADS Web site at www.neads.ca (www.neads.ca/campusnet ), and the CampusNet team can be reached at campusnet@neads.ca, or by calling the toll free number 1-877-670-1256. Jacob Fehr opened his remarks with some background information on his career path. He told forum participants that his graduation from the University of Calgary's computer science program, about one-and-a-half years ago, was a transition period for him. He entered the work force "quite slowly", through part-time work and internships. Currently, Jacob is a full-time software developer with Shaw Cable, researching and developing video-on-demand and pay-per-view technology. Jacob said that there is most certainly no "one size fits all" solution to effectively move from post-secondary education to the workforce. This is true for most students, and Jacob said that his low vision made that transition all the more challenging. Jacob told the group that the key element to a relatively smooth transition was an eight-month internship at Shaw Cable, just after graduation. Jacob told attendees to use their résumé as a "strategic tool." He stressed that, for employers looking at résumés of recent graduates, it's often more important to show skills like independence and initiative in the activities listed, than to have actual experience in the job you seek. That said, he noted that students should look for employment and volunteer experiences throughout their post-secondary careers that allow them to build practical skills to use in their careers. Jacob explained that Shaw Cable is the second largest Cable Company in Canada, offering a variety of services for television, pay-per-view, and Internet. The many services offered by Shaw have allowed Jacob to take on different positions during his time with the company. This helped him to develop a broad set of skills and aptitudes. Jacob said that he has requested and received accommodations for his visual impairment in the workforce. His experience has been positive in this regard. He noted that good employers tend to accommodate the needs of employees with different needs - including those with families, and those with interests that sometimes require alternate work scheduling, such as athletes. Disability accommodations are just part of an accepting work environment. He said that unlike post-secondary education, where accommodations are largely already defined, the workplace does not always provide such easy access to disability-related accommodations. Jacob told those in attendance that it is important for employees with disabilities to know ahead of time what they need to effectively do the job. Jacob, for example, required larger computer monitors and magnification equipment to perform his job. His employer provided the adaptive technology. Jacob advised students with disabilities to establish their career-related goals early, find out what they're good at, research their desired career, and seek out resources that will allow a smooth transition from school to work. Ultimately, it's up to the individual to be assertive in seeking out career goals. Zubehr works with ATB (Alberta Treasury Branch) Financial, in its downtown call centre. The centre allows Albertan's to get answers to banking-related questions, such as loan and account information. In addition to answering questions, the centre can also arrange loans, transfer money between accounts, and perform other financial services. The centre employs some 60 people on its phones, and receives in excess of 20,000 calls per day. Zubehr, like Jacob, pointed out that his disability presented an opportunity for him to get where he is today. He said that the extra challenges posed by having a disability gave him the incentive needed to get ahead. It was this drive to succeed that was important in his transition to the workforce. He said that he considers a transition to be a monumental change in one's life. The shift from high school to university, or from post-secondary education to employment can present many challenges. Zubehr said that personal drive is a vital element to making a successful transition, especially for people with disabilities. He told forum participants that people with disabilities must show others that they are able, rather than disabled. They must demonstrate their abilities. As a person with a visual impairment, Zubehr said that he often has to show those around him that just because he has low vision, it doesn't mean he has difficulty hearing or in any other capacity. Zubehr said his transition was aided by an internship he did through the Canadian National Institute for the Blind (CNIB), in partnership with the Canadian Youth Internship Program. The internship allowed him to work in England for six months, to challenge himself and to prove that he is a capable person. "Of course, you control the outcome of your experience. Whatever you do, you're in control," Zubehr advised forum participants. He said that he was probably one of the first people with a disability to work for ATB Financial, so there has been that element of challenge. But it has been his determination to do his job effectively, and the willingness of his employer to help out, that have made this job such a success for Zubehr and for ATB Financial. In the very few instances when he has had problems with co-workers, he has taken the initiative to speak up about the difficulties. Zubehr emphasized the need for balance on your résumé, to have a selection of volunteer, extra-curricular and employment experiences. Many employers ask new graduates about volunteer activities when they are evaluating job applicants. Zubehr served as president of the University of Calgary's Triple-A disability student group, and volunteered with the university's resource centre. Having these experiences on his résumé, he said, gave him an extra edge in the job hunt process. Zubehr advised those in the audience to not be ashamed to ask for help. It is important to do so, to know where to find needed resources, and to identify when guidance is necessary to further career goals. He concluded, by saying that we must strive for excellence in all that we do. The pursuit of excellence ensures that one is well regarded by colleagues and employers alike. Elliot Hewitt, a Senior Program Consultant, said that he has been with Human Resources Development Canada for two years, and would tell participants about the resources and programs available through HRDC for those interested in transitioning from school to work. He said that the programs of the federal Youth Employment Strategy are geared towards youth from ages 15 to 30, and not specifically for people with disabilities. The department's mandate is to help all youth that face barriers to employment. Elliot voiced his agreement with the comments made by both Jacob and Zubehr, particularly with the point that it is important to be well-rounded and motivated when approaching potential employers. He said that it is important for job-seekers with disabilities to find out what resources and services are available to them within their own communities. Elliot mentioned that there are a variety of programs and resources available for post-secondary students and graduates in Calgary, through HRDC's local office. The Summer Career Placement Program offers employers wage subsidies to hire summer students. For students with disabilities in this program, Elliot said, HRDC does offer financial support to employers in order to offset the cost of disability-related accommodation. Elliot also pointed out that, as evidenced in Jacob and Zubehr's experiences, many larger companies are usually quite willing to accommodate employees with disabilities. In addition, companies often have internal employment equity commitments, much like the federal government. He said that HRDC's student employment programs are designed to improve the ability and motivation of many smaller companies to hire people with disabilities. Elliot noted that resources are available from a host of different sources, such as post-secondary institutions, federal and provincial governments, within the community, and online. "There are certainly a number of programs out there," he said. "Again, it's what you make of them." He encouraged those in Calgary to get in touch with him to further discuss what is offered through the local HRDC office. Information on federal government programs and services can be found in the publication Youth Link: Helping Make the Transition From School to Work, which was made available on the side table in the meeting room. 1. What characteristics make a successful student leader? Passion, initiative and drive are essential qualities of a good student leader. Student leaders should practice diplomacy and develop interpersonal skills. Student leaders need to have ideas and believe in their cause. 2. How does leadership in academic pursuits help in transition to the employment market? Students and employees with disabilities should be open about both their disabilities and their needs, and educate those without disabilities. Good leaders are comfortable delegating responsibilities to others where needed. Student leaders should ensure they have a balance of activities and volunteer work within and outside their school. Co-op and work terms are great ways to gain career experience, and to network with people in the industry. Student leadership provides individuals with skills that are transferable to the workplace. 3. What can NEADS do to promote leadership in our community through initiatives like CampusNet? NEADS should advertise more, send out newsletters, and have a presence at post-secondary career fairs and information nights for high school students. To increase awareness at universities and colleges, NEADS should have "campus ambassadors" at post-secondary schools. Maryon Urquhart spoke about Ability Edge, a program that provides internship opportunities for graduates with disabilities. Ability Edge was started in the late 1990s, by the Career Edge organisation, in cooperation with the Canadian Bankers' Association, and with funding from HRDC. After initial internship offerings in Toronto in a pilot phase, the program expanded across the country and is now operating in Montreal, Vancouver, Calgary, Ottawa and Halifax, as well as the original site, Toronto. There is no age limit for Ability Edge interns, though the program is designed for youth with disabilities. Ability Edge internships are available for six, eight or 12 months, and can be applied for by registering with the program at www.abilityedge.ca. Interns with Ability Edge receive a $1,500 monthly stipend, and ongoing support and career counselling throughout the internship. The Ability Edge and Career Edge programs work with more than 700 employers across the country. Maryon explained that Ability Edge attempts to market its programs through post-secondary career and special needs offices, to ensure students are made aware of the opportunities that exist. Ability Edge also works with community organisations that deal with people with disabilities, such as the CNIB and the Canadian Paraplegic Association. Further, Ability Edge's alumni interns are frequently called upon to spread the word about the program and its internships. Ability Edge internships allow new graduates the chance to gain practical, meaningful employment experience. That way, interns in the program who might otherwise have to take a job in retail or customer service after finishing school, can gain skills leading to a career. The program administrators ensure that all internships advertised on the Ability Edge Website don't require previous related experience, and that they will allow interns to have real, hands-on opportunities in their chosen field. Maryon stressed that interns with Ability Edge would not be filing, photocopying, or making coffee for other employees. Maryon said the online application process is fast, easy, and accessible. Interns can contact Ability Edge staff at any time during their placement, to discuss issues or problems that might arise. This service is in place to ensure that interns get any accommodation support they might need from their employer. While many Ability Edge participants get full-time positions with their host companies after their internship, the program also offers career counselling for those students who do not receive permanent employment. Maryon pointed out that internships allow young people with disabilities the chance to network with employees in their host organisations, as well as others who work in the industry. These contacts can prove valuable in later employment searches. Maryon noted that Ability Edge interns work in a variety of positions, such as customer service, accounting, marketing, human resources and project management. Ability Edge registrants have the opportunity to apply for internships advertised on both the Ability Edge and Career Edge (www.careeredge.ca) Web sites. Maryon told forum participants that, if internships are not available in their home cities, they could contact her and let her know of an organisation they would like to work for. From there, Ability Edge can attempt to arrange an internship with that organisation. Chris Sutarno is with the Canadian National Institute for the Blind's (CNIB) Employment Accommodation Service. The program attempts to find employment for the organisation's clients, who are visually impaired, blind, or deaf/blind. The program was developed due to the fact that many CNIB clients do not often follow the typical career path. Chris explained that, often, CNIB clients forego part-time employment during youth and school years, remaining instead in the academic environment for extended periods. Consequently, while these individuals have long and distinguished educational backgrounds listed on their résumés, their employment experience is rather limited. Chris said that the unemployment rate for people with visual impairments ranges between 60 to 80 percent. The CNIB's Employment Accommodation Service (EAS) attempts to ensure these individuals have better access to career opportunities, not only within their own communities, but also across the country. Chris noted that many employers have misconceptions about people with visual impairments, and that these misconceptions can reduce the individuals' chances of obtaining meaningful employment. He said this attitude stems not from employer ill will, but rather because they don't often come across people with significant visual impairments. The CNIB attempts to combat these stereotypes, helps employers find qualified candidates with visual impairments, and instructs employers on how to accommodate new hires. The program is marketed as a professional placement agency for people with visual impairments, and the EAS has sent out an employment package to the top 1000 employers in Canada, as identified by Report on Business magazine, to inform these organisations of the CNIB's services. The program also provides a résumé database where people with visual impairments can post their résumés. The database is open to potential employers from across the country. In addition to the placement function, the CNIB's program offers accommodation services to employers. CNIB accommodation consultants are employed in cities across the country, to work with employers who hire people with visual impairments and may have questions about how to properly accommodate these individuals. The consultants look at what is in place at a workplace, and help to address any physical or technical barriers that may exist. Further, the consultants conduct awareness sessions with all employees at the workplace, to ensure other employees are prepared to work with a visually impaired employee. Chris noted that there are about 350 job-ready clients in the EAS program, and he said that the CNIB aided in 125 placements within the first 18 to 20 months of the program. Those interested in joining the program can go to: www.cnib.workopolis.com, or call Chris Sutarno at 416-480-8689, or Calgary-area contact Dan Watt at 604-785-9772. Michelle told participants that all the divisions of GE share the same core values - acting with unyielding integrity, commitment to performance, and change. These values influence the way GE and its employees operate, the way it assesses performance, and the way the company promotes its leaders. She emphasised that change is a significant part of the company's culture. As soon as employees get used to doing something by a certain process or with a certain technology, it's being improved upon. Michelle further explained that, although the corporation is very large and the divisions diverse, there are efforts made to work together to share best practices between divisions. One example she offered was that the medical systems division created technology that can remotely monitor hospital CT scanners, and that technology was shared with the aircraft engines division, which developed a method to remotely monitor engine performance. She stressed that GE is committed to diversity, and read a quote from new CEO Jeff Immelt outlining that commitment. The corporation displays its commitment to diversity through yearly training of employees in this area. The corporation also places an emphasis on community involvement, which further stresses the commitment to diversity. The company offers flexible work schedules for those who need this accommodation. Part-time or work-from-home arrangements are possible. The company also recognises employees have individual needs, and attempts to accommodate these as much as possible. Michelle pointed out that all the company's buildings are wheelchair accessible. Michelle said that some of the qualities GE looks for in recent graduates seeking employment are academic achievement, analytical ability and problem solving skills, initiative, self-confidence and interpersonal skills. The company also seeks individuals with strong community attachments, and a commitment to get involved. She noted that many of these attributes were brought forward in the morning session as assets of a good student leader, so it should come as no surprise to those in attendance that GE seeks the same skills in its employees. Michelle ended by emphasizing that GE is a company that has been in existence for many years, and is one that should be around for many years to come. Therefore, it is an established, stable employer for recent graduates. Students interested in graduate opportunities or student internships can go to www.ge.com/canada/campus for more information. Marianne Ferkul is the Recruitment Co-ordinator at Imperial Oil in Calgary. She told the group that her speciality is campus recruitment, which she has been involved in for close to five years. She outlined that she would be discussing Imperial Oil's work, its recruitment process, and also the steps the company takes to ensure accommodations are met for employees with disabilities. Imperial Oil is one of the largest producers of gas and crude oil in Canada. Marianne outlined what she called the 'Upstream,' 'Downstream' and 'Corporate' divisions of the company. The upstream division manages Imperial's natural resources operations. The downstream is the products and chemicals division, which sells under the ESSO brand name. The corporate division houses support groups, such as human resources, information technology and procurement services. Marianne noted that Imperial Oil has been in existence for over 100 years, and has approximately 6,500 employees. Marianne told the audience that now is an ideal time to enter the job market; given the demographic shift in Canada, many employees will be retiring in the next 10 years. She said that the same is true at Imperial Oil. This scenario means that there will be many opportunities in the workforce for those who are currently in school. Marianne said that positions with the company, for which there is recruitment of new graduates, are sent to campus employment centres and posted on Imperial's own Web site, www.imperialoil.ca/campus. Graduate positions are typically posted in the fall and then again in January, if they are not filled during the initial phase. Student summer jobs and co-op terms are posted every four months, directly to schools. Marianne noted that every year, 80 to 100 student positions are filled, as well as about 90 graduate positions. She said that the student positions, both during the summer and through co-op work terms, provide great opportunities for students to determine whether Imperial Oil is a good career fit for them. Marianne said that the company looks at academic achievement in the hiring process, while recognising that extenuating circumstances can affect performance in school. They also consider related experience, which can an asset, but is not always necessary. She said the oil and gas industry typically recruits graduates from engineering, computer science, business and earth sciences programs. Marianne said that she's been with Imperial Oil for 18 years, and has held 6 different positions within the company. She said the company motto is "an employer of choices." She said the ability to experience more than one position with the company ensures that it becomes a career company for most people. She also noted that the workforce strives for diversity, and the company emphasizes a safe, respectful and open work environment. To help promote diverse employee needs, she noted that the company offers alternative work schedules, time off, and other programs that provide flexibility. New hires have hands-on training with the company, and on the job coaching after that, as well as performance feedback. The company philosophy to promote and develop within the organisation also ensures that employees have an opportunity to move up and experience new challenges if desired. The company has a disability benefit program, which covers accommodation needs. Marianne said that Imperial Oil employs two full-time accommodation specialists, who work with occupational health professionals to ensure employees with disabilities get the accommodations they need. 1. Why do you think that there is a high unemployment rate among graduates with disabilities? High unemployment rates among people with disabilities can be attributed to lack of knowledge of disability by employers, lack of transferable skills and work experience by people with disabilities, and lack of confidence in oneself, which is needed to properly present yourself to employers. New graduates with disabilities often don't know about the services that exist to help them find employment. Students are often too focused on academics to see what they require in the 'big picture.' They don't set career goals for themselves early on. Campus career centres are not accessible enough for people with disabilities to properly access resources. There aren't sufficient numbers of employment placement agencies with good knowledge of disability needs. Some people may not have the skills or technology to use the Internet to find jobs. Students with disabilities need to be taught how to network effectively, and how to cold call employers regarding employment. 2. What method(s) do you use to learn about employment opportunities? Employment opportunities can be found through career fairs, the Internet, newspapers, mentorships, co-ops and internships. There should be a "one-stop shop" type Web site, with links of different sites for people with disabilities to find employment. People with disabilities need to network as much as possible, and be their own advocates. Research companies as much as possible before interviews. It's important to know the employer you are applying to. There needs to be better communication between people who hire and the people who are employed in a company; HR people need to know what skills are required for a position, and what are only "desirable." This way people with disabilities will not be passed over based on skills they don't necessarily need. Joining professional organisations in your field is a good way to network with similar industry people. 3. What can employers and programs such as Ability Edge do to ensure that qualified students and graduates with disabilities learn about available job and internship opportunities? Programs like Ability Edge should continue to make sure students with disabilities are aware of their opportunities and programs. Promote the Web site, and speak at events such as this. There should be partnerships formed between people with disabilities and employers, so employers have a better knowledge of disability issues. Employers need to conduct more in-house anti-discrimination training. 4. Would you disclose your disability before and/or during a job interview? If so, why? If not, why not? The decision to disclose a disability to an employer depends on the ramifications that might come from that. Sometimes it is best to just disclose in a cover letter, especially with 'equal opportunity' employers. There's no clear answer as to whether people with disabilities should disclose to employers. It depends on the nature of the disability, and whether the individual is comfortable with disclosure. Sometimes disclosing is necessary, so that accommodation needs are met. 5. What skills do you think are the most sought after by industry today? Problem solving, research skills, flexibility, interpersonal skills, diplomacy, attention to deadlines and creativity are all-important skills to employers. Computer literacy is another key skill sought by employers. Leadership and teamwork are both essential in the workplace. The Calgary Student Leadership and Employment Forum was a very successful event. The presentations and discussions were excellent and the recommendations from forum participants will be of great benefit to the Association as we proceed with the project. Special thanks for assistance in planning the event goes to Sanjeet Singh, Alison Beattie, Jennison Asuncion, Steve Estey and Neil Faba. Chris Gaulin, NEADS' Website Architect supported technical equipment requirements during the meeting and alternative format needs of participants. We'd also like to thank the Disability Resource Centre, University of Calgary, and staff member Judy Smith for serving as a local contact for the forum.